A suspect has appeared in court charged with murdering a man whose teenaged brothers were killed fighting for Islamist jihadists in Syria. Daniel Macleod, 36, of Lambeth, south London, was remanded in custody by Brighton magistrates earlier and must appear at Lewes Crown Court on Monday. He is accused of murdering 22-year-old Abdul Deghayes who died on Sunday. Mr Deghayes, whose brothers Abdullah and Jaffar died in Syria in 2014, was found in a car in Brighton's Elm Grove. 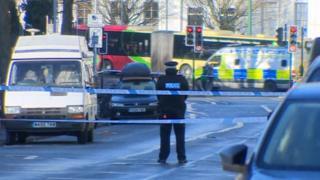 The car had crashed and he was found with fatal stab wounds from which he died the next day. His brothers, Abdullah Deghayes, 18, and Jaffar Deghayes, 17, died fighting for an Al-Qaeda-affiliated jihadist group in Syria in 2014, following in the footsteps of another brother, Amer.